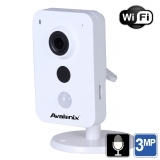 3 Megapixel Security Cameras are network based surveillance cameras that provide video resolution of 2048 x 1536 pixels over a digital signal using CAT5e/CAT6 cabling. If you need video resolution greater than 720P or 1080p, then we suggest you consider these IP based cameras because of their affordability and performance. Although the difference in picture size in pixels between 2 Megapixels and 3MP is minute, using a IP camera with 3 megapixel resolution in certain daytime applications can make a noticeable difference. 3MP IP Cameras are among the highest resolution megapixel cameras on the market, and are quickly becoming more affordable. Like all our HD security cameras, they are exceptional for use where there is a need to capture fine detail that can be maginifed after video has been recorded. All of our 3 megapixel cameras are Power Over Ethernet (PoE) and have RJ45 connectors for use with network cabling. These cameras can be powered using a PoE network switch, PoE NVR.